Is anyone else as in LOVE with summer as I am? OkOK and fried mozzarella. I mean, obviously. Balance guys, balance. 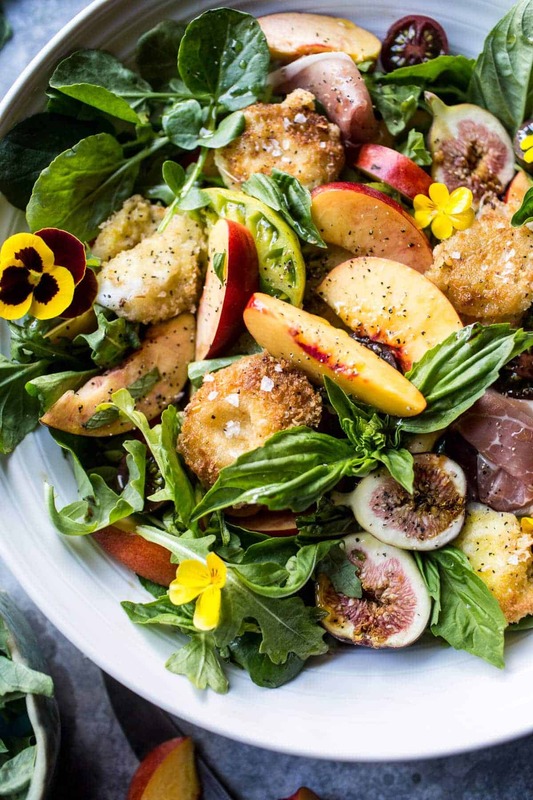 So, let’s chat about this here Nectarine and Fried Mozzarella Caprese Salad. First things first, it’s pretty simple, but still delicious none the less. 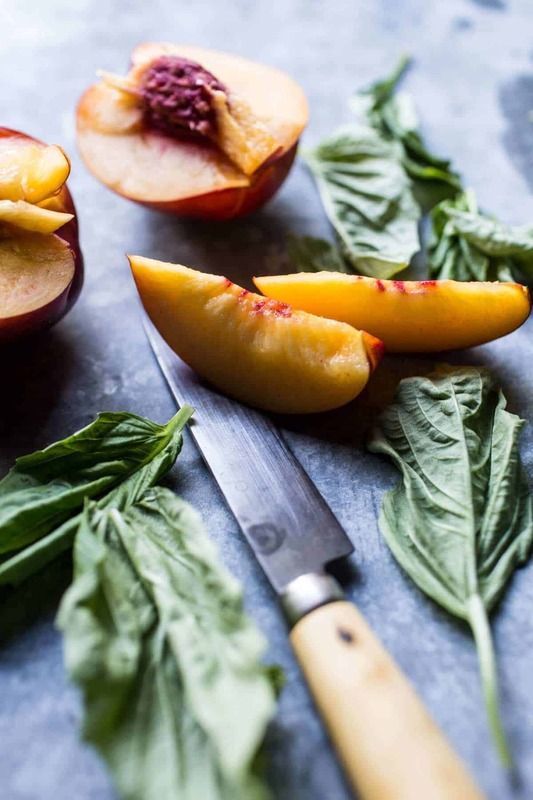 Fresh ripe nectarines, paired with sweet figs (if you like, they’re totally optional, but I love figs), perfectly ripe and super pretty heirloom tomatoes, fresh garden basil and prosciutto…you know, for good measure. Then of course, you need to add that fried mozzarella, which yes, is just as dreamy as it sounds. So I guess this is kind of my take on an elevated caprese salad. Lately, I’ve been so all about burrata, that I kind of forgot about mozzarella. Truth be told, most of the time I find mozzarella to be a little bland. I mean, I do love it, and it has its place in and on so many dishes, but sometimes it just needs a little boost, you know? Ok, before I go, please cross your fingers, say a little prayer, whatever you do… Asher’s beloved cat Nikolai is once again MIA. You see that peculiar cat is afraid of strangers and on Sunday my mom’s cousin Amy and her family spent a couple of nights at my parents house while my fam is away in Mexico. Amy, Tim and their kids are about as nice as they come, but that weirdo of a cat has been missing ever since they came. No food, no water, no litter box use.? PS. 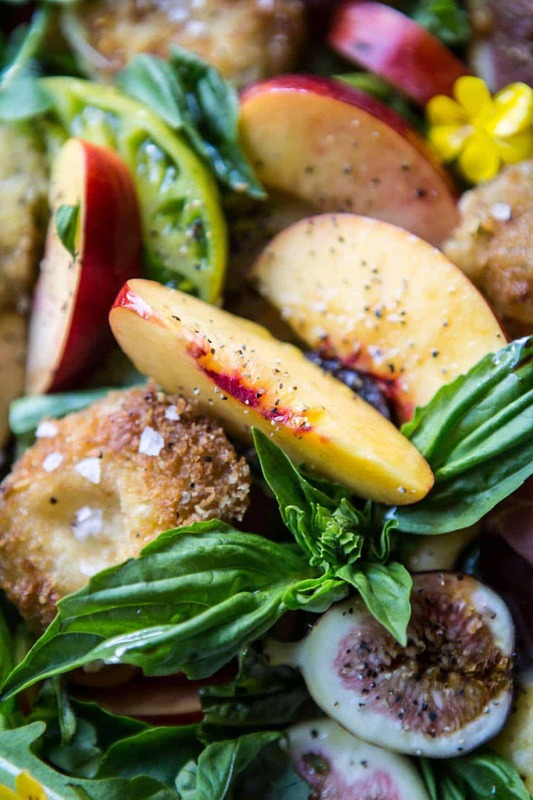 if you’ve yet to try this combo of nectarines, basil and fried mozzarella, you HAVE to try it. It’s one of my summer favorites and everyone who does give it a try loves it. But then how could they not? So GOOOOD. It's pretty simple, but still delicious none the less. 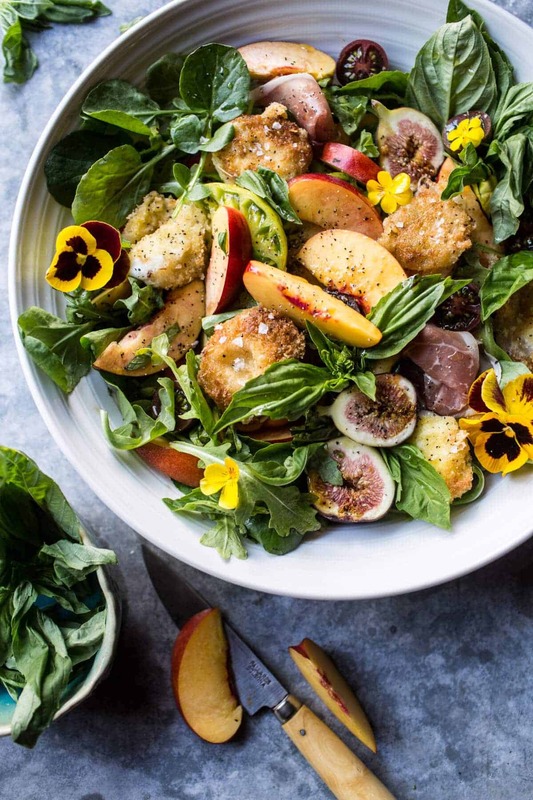 In a large salad bowl, combine the nectarines, tomatoes, cherry tomatoes, figs, basil, watercress or arugula and prosciutto. In a small bowl, whisk together the olive oil, balsamic, pomegranate molasses, salt + pepper. Drizzle a little of the vinaigrette over the salad and gently toss. Fry the mozzarella (see below) and add it to the salad. Serve while the cheese is warm. In a large bowl, combine the Panko, flour, parmesan, salt and pepper, mixing thoroughly to combine. In a small bowl, lightly beat the eggs. Take each slice of fresh mozzarella (or bocconcini balls) and coat it in the beaten egg, then dredge it through the bread crumb mix, pressing on both sides to adhere. Repeat with the remaining slices. Heat a large skillet over high heat. Add a drizzle of olive oil. Fry the coated mozzarella, turning carefully once or twice until golden and the cheese begins to melt, but still retains its shape, about 1 minute on each side. Drain on paper towels. Sprinkle with salt. Serve warm atop the salad. A little salad with my (fried) cheese please! 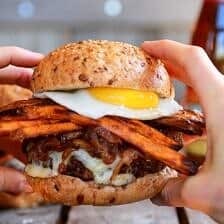 Fried Mozzarella and Caramelized Peach Caprese Burger. 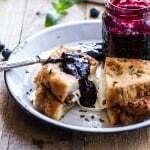 Mozzarella in Carrozza (Fried Mozzarella Sandwich) w/Blueberry Balsamic Jam. 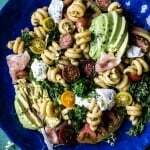 Avocado Caprese Pasta with Grilled Broccoli Rabe. YUM, this salad is perfection in a bowl! 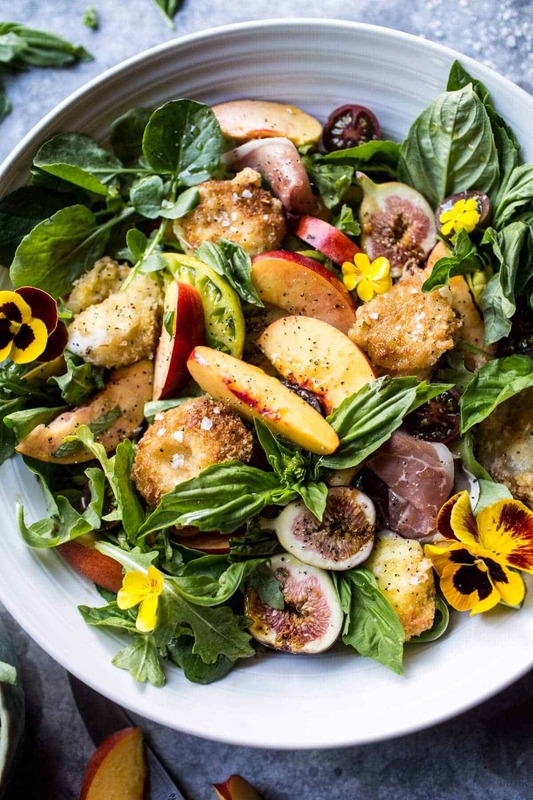 The fried mozzarella just sound divine and the combo of nectartines and figs with it, YES PLEASE! P.S. I’m so sorry about Nikolai. I will definitely say a prayer that he comes home for Asher. Tori!! Nikolai found Asher as soon as she was home! 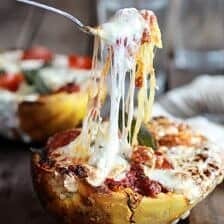 You gotta try this bowl!! I know you’ll love it!! 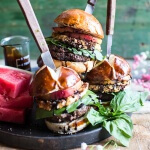 Tomatoes can be a tad boring, but adding these to the top before serving will add a Wow to the dish. Thank you and next trip to the store will gather all for the salad too. Hi Leslie! That would be perfect! I hope you dinner was delicious!! Wow this is beautiful. Truly. And fried cheese in a salad? What an amazing idea!!! You do seem to take advantage of summer’s best fruits! Holy mackerel, that salad looks amazing. Fried cheese forever please! Right!? 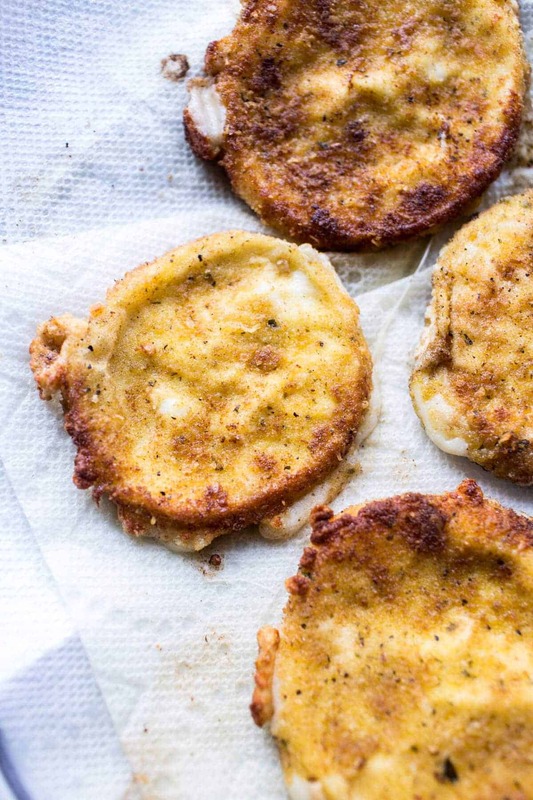 Fried cheese might be the best thing! Nectarines are my favorite summer fruit. It’s a little early for the local ones here but the stores are selling some decent ones. I just foolishly passed up some beautiful figs yesterday. Looks like I’ll be going back for those today! 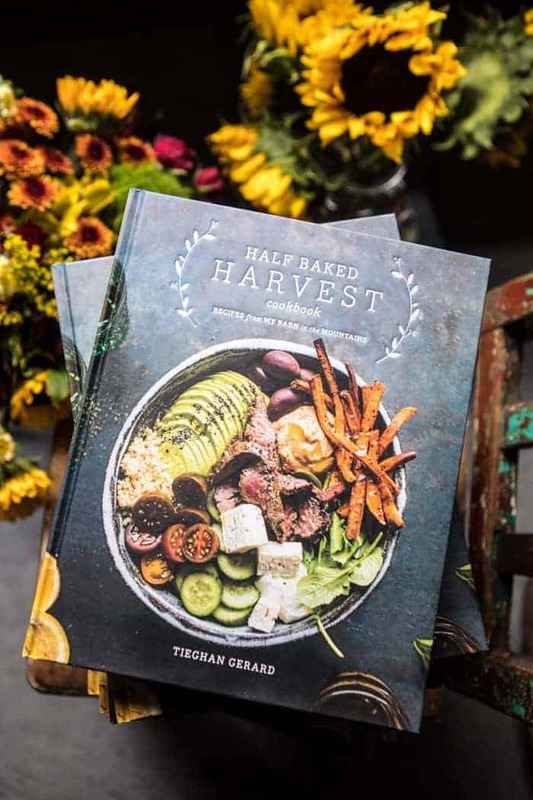 I could see placing this gorgeous salad on top of a flatbread to change it up, too. Another stunner, Tieghan! Oh my gosh, you need to get those fresh figs!! They’re the best!! 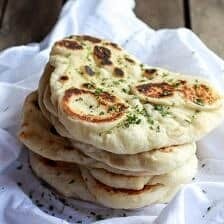 On a flatbread!! OMG Yes that sounds so good!! 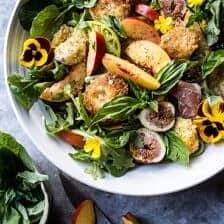 I love this, such a beautiful and delicious salad! And fried cheese, yum!! Thanks Lilli!! I’m loving the fried cheese as well! Your husband's joke reminds me of my college days at MIT…where every joke was like that. Sigh.Love this pasta! So fresh-flavored and with my favorite spring veggie! what’s worse is that I’m sure they’ll present San Diego as a place that would APPEAL to assholes like that, which will just attract more assholes and create a whole vicious cycle./misses living in San Diego. Need some google help. How can an otherwise healthy, non-drug-using, non-smoking, non-abused 13 yr old get a collapsed lung? Texteen’s youngest step-brother has been hospitalized for this since Saturday. Nothing I see online mentions children or adolescents. The kid plays musical instruments and school soccer, but it isn’t soccer season. No sword fighting that I know of and he doesn’t have a broken rib. Mmm I am a huge fan of fried cheese, and it looks so good here! Good luck on finding the cat. Hi Phyllis!! We found the cat, he came out as soon as Asher came home!! Thank you, hope you love the salad! We’re trying to be healthy, so I’m using goat cheese instead of fried mozzarella. Thankfully, we had just enough ripe figs on the tree! I am serving this for dinner tonight, but snuck a taste and it’s yummy! 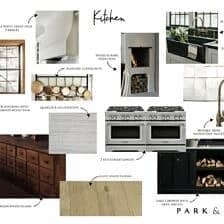 I always love your creations in the kitchen! Oh, I added blueberries, too! YAY Sounds delicious!! Hope it was a hit! 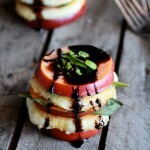 I’m in love with nectarines and caprese anything… this salad is my dream! Thank you Laura!! So happy its your dream salad!! So…I made this salad for a dinner party last night and I must say EVERYONE raved about it. Love how all the ingredients worked so well together. I will definitely be making this one again. Thank you so much! YAY! So happy it was a hit! Thanks so much Sarah! I am drooling reading this! 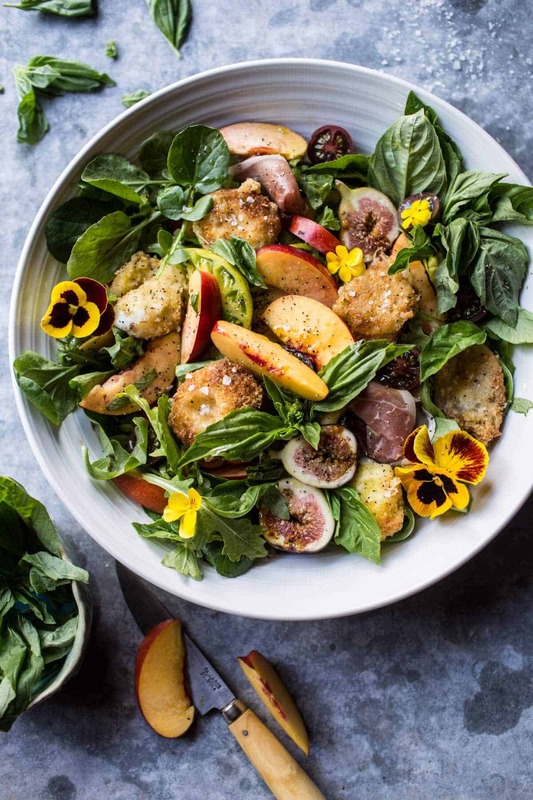 This salad looks like such a dream and I’ll definitely be making it soon! Thank you so much Skylar! Made this for a dinner party! Huge success. I could not find figs so i used blackberries and raspberries. 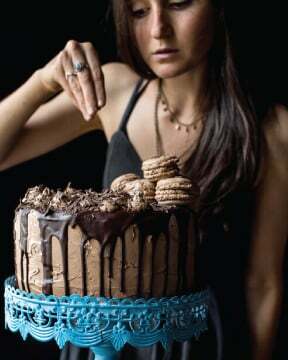 Definitely going to be making this again! Great substitution!! So happy you liked it Roxanne! Thank you! Please! Please! Please! Tell me where you got the paring knife in the last picture of this post. Its too perfect. Not to overlook the genius of your caprese. I really love the salad with fried mozz cheese but that knife is from my dreams. Do you remember where you got it? Thanks!